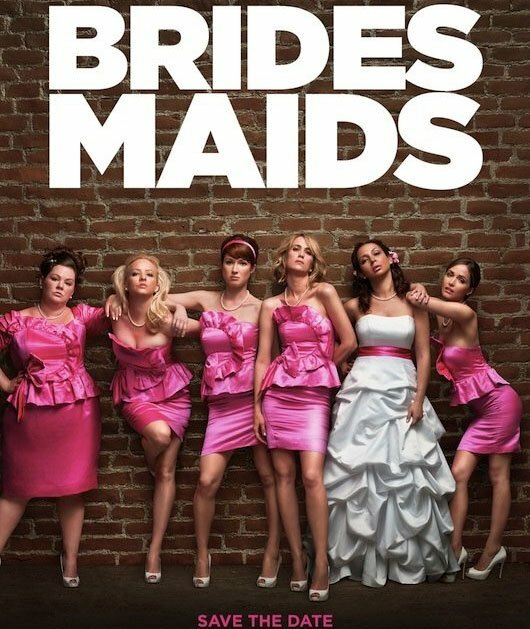 Bridesmaids is easily one of my most anticipated movies of the year. In addition to getting great buzz out of test screenings, the film is directed by Paul Feig (the creator of Freaks and Geeks), produced by Judd Apatow (The 40 Year Old Virgin and Knocked Up) and stars some of the funniest comediennes working today, including Kristen Wiig and Ellie Kemper. It's also hard to ignore that it's being described as a female version of The Hangover. Despite its May release date, we still don't know when we might be getting the first trailer, but today we do get at least something. Moviefone has launched the first poster for the comedy and it's quite inspiring. For the first time in years we may see a female driven movie that's not about a workaholic who believes she has no time for a man in her life before meeting Mr. Right. With this one we're getting a brickwall with six pissed off ladies in wedding attire. Save the date indeed. Check out part of the poster below and head over to Moviefone to see the whole thing. For more on Bridesmaids, head on over to our Blend Film Database.